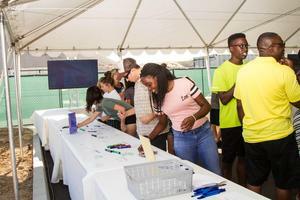 SANTA CLARITA, Calif – Nearly 400 people came to Castaic High School Friday for the “Countdown to Castaic High School” event. For most in attendance, it was their first glimpse at the state-of-the-art campus still under construction. 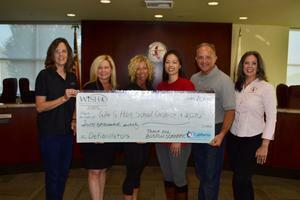 The WiSH Education Foundation (WiSH) joined efforts with the Valencia Neuromodulation Division of Boston Scientific to raise funds to purchase additional Automated External Defibrillators (AED) for schools in the William S. Hart Union High School District. SANTA CLARITA, Calif – The William S. Hart Union High School District’s Governing Board voted unanimously to approve the appointment of Brad Renison to become the new Director of Transportation. Most recently, Mr. Renison has been serving as the Interim Director of Transportation. SANTA CLARITA, Calif – The William S. Hart Union High School District’s Governing Board voted unanimously to approve the appointment of Dr. Catherine Nicholas to become the new principal of Sequoia School. 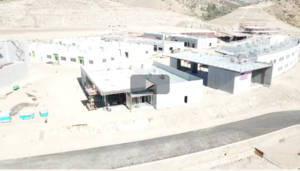 Drone video footage of the Castaic High School building site taken by Castaic High School Construction on June 29, 2018. SANTA CLARITA, Calif – It has been 50 years since Canyon High School became the second high school in the William S. Hart Union High School District, and on September 4, 2018, you can join alumni, students, staff and parents to celebrate the anniversary. SANTA CLARITA, Calif – The William S. Hart Union High School District’s Governing Board has approved the appointment of Eran Zeevi to become the new principal of Bowman High School. Mr. Zeevi will replace the retiring Robin Geissler. SANTA CLARITA, Calif – The William S. Hart Union High School District has extended the deadline for a new member of the Measure SA Citizens’ Oversight Committee to June 22, 2018. This member will serve a two-year term with a maximum of three consecutive terms.